Manicure nail varies according to the method of processing the cuticle: European, trim, hardware, hot, etc. Previously, many women prefer a classic manicure, but today more and more popular becomes a hardware method of removing the cuticle. Both of these options have significant differences between them. This kind of manicure is called "wet" because of the way soften cuticles. When it runs the nails first, give the necessary shape, and then steamed hands in a special solution. After the cuticle is soft, it gently push and removed with tweezers. This manicure is not only the most complicated, but also quite dangerous — in the process of its implementation there is a risk to injure the cuticle and enter the body of any infection. That's why all of the tools that the master uses in his work should be subjected to careful treatment in the autoclave. Classic (edging) manicure is recommended to do not more often 1 time a week. It is best suited for those who have quite rough and big hair, but in the presence of close to the surface of the skin small capillaries, the very thin cuticle or tender skin from its use is to abstain. This method of nail care is one of the varieties of the European manicure. For its implementation used a special apparatus, which is equipped with a rapidly rotating grinding heads. 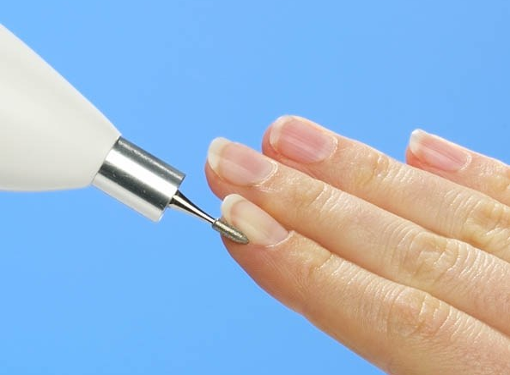 Using this device removes dead skin cells of the cuticle and the skin around the nail remains intact. This type of manicure is considered to be "dry" grinding runs without the use of any emollients on dry skin. You should not do hardware manicure at home, it is best to entrust it to a professional, as doing it alone there is a risk to cause significant harm to the nail plate. Hardware manicure has many advantages. It helps to slow down the growth of cuticles, prevent splitting nails. Specially recommended for people with damaged nails, fast growing, dry cuticle. But still, if the skin around the nail is very thin, to perform hardware manicure is undesirable. To maintain the tidiness and beauty of your nails, it is necessary to resort to the use of hardware manicure no less than 2 times per month. To summarize, it is safe to say that the most safe and simple enough is it hardware manicure — when it is executed there is no possibility of injury to the skin around the nail and, consequently, the risk of Contracting any infections. The only disadvantage of this method — necessity of special apparatus and skills. What to choose, only you can decide.